•Patrice Vigier pioneered graphite neck construction in the 1970s and 80s, and after much research and fine tuning Vigier moved away from the colder and brittle sounding solid graphite necks to a composite of 90% wood and 10% graphite - this yields the same strength and rigidity famed on graphite necked instruments but with more depth and warmth in the low and mid range and is smoother in the upper registers giving a balanced and musical tone. Vigier are World renown for their use of Graphite in the necks of their basses, pioneering the concept back in the 1980s. The new 90/10 system gives you the undeniable stiffness of the graphite but with the warmth and added tonality of wood - the perfect combination! With its pickups mounted towards the bridge the tone is aggressive and punchy, but the pickups have plenty of depth and bass for a full tone. This bass is just alive when played and the neck is one of the slimmest and easier four string necks available. 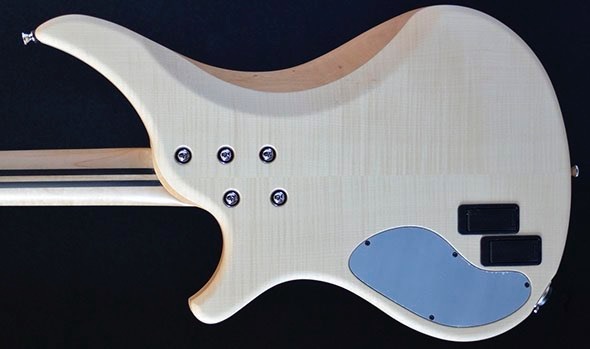 The Flame Maple top and back are beautiful and the construction is faultless. •Exclusive Carbon reinforced bolt on neck (ensures total stability of the instrument in terms of sound, action and resistance to even the most extreme climate changes. The Passion is the latest bass from the Vigier company and was debuted at the Spring NAMM show in 2008. Built in France by Patrice Vigier and his team of skilled craftsmen, Vigier basses have been a popular choice for low-enders all over the world for the last 30 years. Similar in design to their Arpege instrument, the Passion features close position pickups and Vigier’s 90/10 neck construction system. This year marks the thirteenth year of this design which is essentially a 90% wooden neck – in this case naturally dried maple - reinforced with 10% carbon, in the form of two carbon strips, visible on the back of the neck. Vigier claims this system to have ‘strength, stability and sustain, and a lack of dead spots not normally found in a conventional guitar.’ The Passion also boasts the familiar Vigier body shaping, and at £2014 it’s a serious purchase, meaning that the instrument will have to fight its corner in a crowded top-end market. First impressions are good. The Deep Burgundy stained flamed maple top looks very attractive and the chrome controls and monorail bridge are the perfect compliment. The slim, ergonomic body shape is appealing and the Phenowood fingerboard, uncluttered by position markers, is a material formed from a combination of wood and resin fibres to give the feel of wood but the strength of graphite. The curve at the end of the headstock is mirrored by the shaping of the neck where it fits into the body, which is a nice touch, particularly since the idea is carried through onto the fretboard. The unusual arrangement of the tone controls and the visual aspect of the close bridge position of both pickups are particularly striking, if a little crowded. The Passion boasted excellent build quality throughout: the finishing was top-notch across the body and neck, and the fretwork was very neat. The action was sensibly set, and the bass arrived in my hands well adjusted and ready to go. All five of the tone controls were well-secured and turned with a satisfying stiffness. The top of each one also featured a small indent to indicate where the centre detent was, something I found to be a very useful addition. The bridge is a quick-release monorail system that features individual adjustability for each string and saddles that can be locked in position by tightening an allen screw. String changes using this system were nice and straightforward: after slackening off the string, it can simply be lifted out without any need to thread it back through the bridge itself. Turning the bass over, the control cavity turned out to be neatly screen painted and the wiring and soldering for the Glockenlang preamp was very tidy indeed. There were two flip top battery compartments on the rear of the instrument, neatly arranged in an offset pattern. Love them or hate them, it seems that these flip top systems are here to stay - no bad thing in my opinion - since they make battery changes so easy. The bolt-on neck was firmly secured by a five-bolt arrangement with recessed bevels and seemed very sturdy. At the other end of the bass a zero fret is employed together with a Teflon/Graphite composite nut. In use the Vigier was very comfortable. It sat nicely on the lap with no neck dive, and was very well balanced with a strap. The instrument felt light and ergonomic when used live, and while I personally prefer satin finishes, the high gloss lacquered neck was slim and fairly quick to get around. It was disconcerting at first not having a pickup in neck position to anchor my thumb on, but I adapted to this quite quickly. On the whole, the Passion was enjoyable to play. The 90/10 neck design system offers a solid, dependable neck; I didn’t notice any obvious dead spots at all – sustain was also very good as promised. My only minor complaint was that I found that the string to body height at the end of the neck was a little high and made techniques such as popping somewhat uncomfortable. Plugging in I found that Passion had a naturally smooth tone with a very subtle mid-range ‘honk’ when set flat. This unaltered tone was great for fingerstyle playing, and formed the basis of my tone for a whole set when used live. 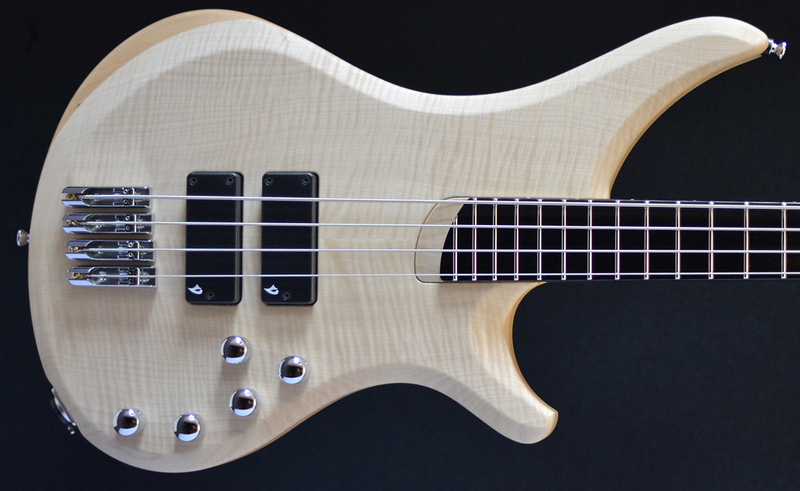 The pickups are made especially for the bass by respected pickup manufacturers Delano. Soloing the neck pickup, (although it’s not really a neck pickup as such) resulted in a fatter tone that was great for punchy slap grooves and really seemed to hit you in the gut. Gently boosting the Bass and Treble gave the slap tone even more punch and depth – very nice indeed. Soloing the bridge pickup yielded a more cutting tone as one would expect, and while it would certainly slice through an unfriendly mix rather well, I personally found it a little nasal, and opted to add in a little extra bass. As is often the case, the best results came as a result of blending the two pickups, this time in favour of the ‘neck’ pickup. The result? A fantastic, full bass tone that worked well for both fingerstyle and slapping and didn’t require too much, if any, adjustment when moving between the two styles. The Passion also handled old school soul and Motown tunes well, a tone mainly achieved by soloing the neck pickup and boosting the bass EQ significantly. Pick-style rock was also well catered for, again by favouring the neck pickup. Having the two pickups in such close proximity and so far back towards the bridge would never have seemed to me to be a good idea, but it really does work rather well. The tonal range of the Passion is impressive, and the position of the neck pickup - which is probably in between where the bridge and neck pickups would traditionally be is often referred to as the ‘sweet spot’ for this reason. Most of my favourite tones came from favouring this pickup either fully or in part. I often think that the best measure of a test instrument is how long you spend playing with it. Well, I spent quite some time with this one. It saw some live use, during which it delivered the goods nicely, and was tough to put down at home as well. Plus: Great tones, feels like a solid and dependable instrument. Minus: Unusual look of the close position pickups and the way the controls were arranged, but these are minor concerns. Overall: An excellent addition to the Vigier range, and one that will no doubt find its way into the hands of many ‘passionate’ bassists.